On a recent afternoon, I was organizing my wool. 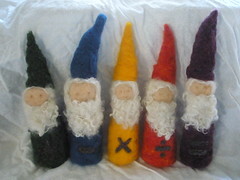 I had not done much needlefelting recently, so I thought it would be fun to take a little break, pick up the barbed needles, and start creating some natural toys for children. Ended up making a dozen of the wool felt balls. It was a very relaxing and enjoyable way to spend an afternoon. 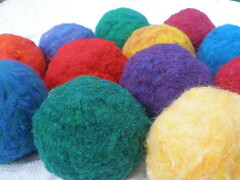 These felt balls (to the right) are needle-felted from beautifully soft, 100% wool roving. They are colorful, safe, and fun to play with indoors. They are the perfect size for small hands, and easy to catch and throw. 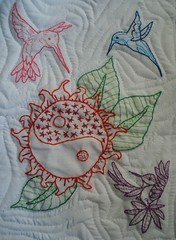 Each felt ball is approximately 3 1/2″ (8.5 cm) in diameter; and 10 1/2″ (26.5 cm) in circumference. The core is clean roving that was from one of the sheep I raised at Harvest Moon’s organic farm. 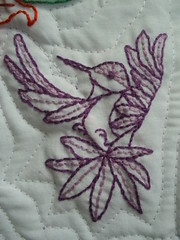 The outer layer is wool roving that has been hand-dyed with natural dyes. Some of the wool balls are a single color…while others use roving that have a lovely blend of shades and specks of vibrant colors. If you’re interested in purchasing a felt ball (or a whole collection of them), please visit Harvest Moon by Hand. These four postcards were made for the quartered postcard swap on Swap-Bot. 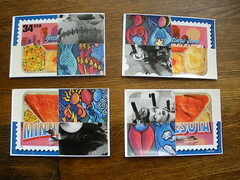 The challenge was to take 4 postcards, cut them into 4 identical pieces, and then glue the pieces onto another piece of stiff paper to make a postcard. It was a quick project to do, but definitely is something that helps me try to meet my goal in 2010 of creating something each day. Sometimes what I make can be completed in one day (like these postcards) and other times the project is much more labor-intensive (like a sashiko quilt I made this spring/summer). These postcards were sent to people throughout the world. In exchange, I receive 4 postcards from other people who live in different parts of the world.